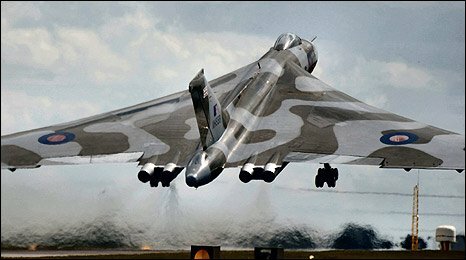 "It made the hairs on the back of my neck stand up" said Dr Robert Pleming, chief executive of the Vulcan to the Sky Trust, of the aircraft's first public take-off. "All the hospitality tents emptied, all the movers and shakers of the industry came out, the crowds at the fence must have been 20 deep. "Everyone was silent, all you could hear was the roar of the engines and the clicking of cameras. And suddenly she was up." 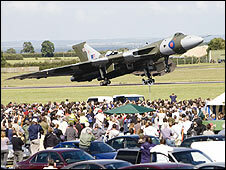 The restored Vulcan bomber XH558 first flew in front of the public at RAF Waddington in Lincolnshire in July 2008. But, it could be permanently grounded if the project does not raise another £1m by the end of January. "This whole project has run on the power of a dream" said Andrew Edmonson, the project's engineering director. The restoration, based at Bruntingthorpe in Leicestershire, went roughly double over budget. The operational phase, actually taking to the air, has running costs of about £1.6m per year - insurance alone costs £180,000. The main source of income was supposed to be corporate sponsorship but the economic downturn is causing problems with that. He added: "Marketing budgets have come into very strict review and have been trimmed right down and that has really hurt us. "It's a real problem, almost a perfect storm in terms of funding the project." Despite delays caused by a sticking undercarriage flap, engine problems and faulty brakes, Mr Edmonson said, the aircraft had been "reasonably reliable". "One of the main problems we had was with the electrics. It was all cutting edge, top secret stuff in the 1950s but it didn't like the modern power systems. "We kept trying to connect it up at airbases and it kept blowing fuses. That became an art in itself." Another issue was the sheer size of the aircraft - 97ft 1ins (29.59 m) from nose to tail, 99ft 5ins (30.3 m) wing tip to tip. 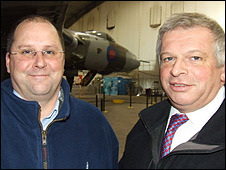 "We would be assured (the airfield) had a space for us," said Mr Edmonson. "But there was often a bit of an awkward pause when the local ground crews saw her. "Then it was a case of finding out if the space was big enough, or if they had a tractor powerful enough to move her." While the pilots apparently find the aircraft a pleasure to fly, the vintage machine has a few peculiarities. "It doesn't like the wet," Mr Edmonson said. "It seems to get in everywhere. On one take off, the engineer reported seeing water pouring out of the wings." But with all the effort, expense and stress, was the first year in the air worth it? Dr Pleming's response goes back to that first flight at Waddington when it joined the Battle of Britain Memorial Flight's Lancaster. 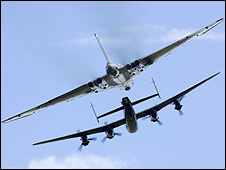 "That first flight with the Lancaster was really important because there was only 11 years separating the first flight of the Lancaster in 1941 and the first flight of the Vulcan in 1952. "That is one of the big reasons I got involved because people forget what a huge achievement it was, what a huge leap in technology. "From the old Lancaster with piston engines, with straight wings, chugging along at 200 mph (322km/h) to this amazing new concept, the tailless Delta wing with its jet engines, electric controls and countermeasures, just a completely new generation of aircraft." "It is as awesome today as it was then."